Today was the start of a new home season for the Mystics and end result looked a little like the old team from last season in the first half. The problem for the Mystics is that they dug a quick hole that they were not able to recover from late in the game. 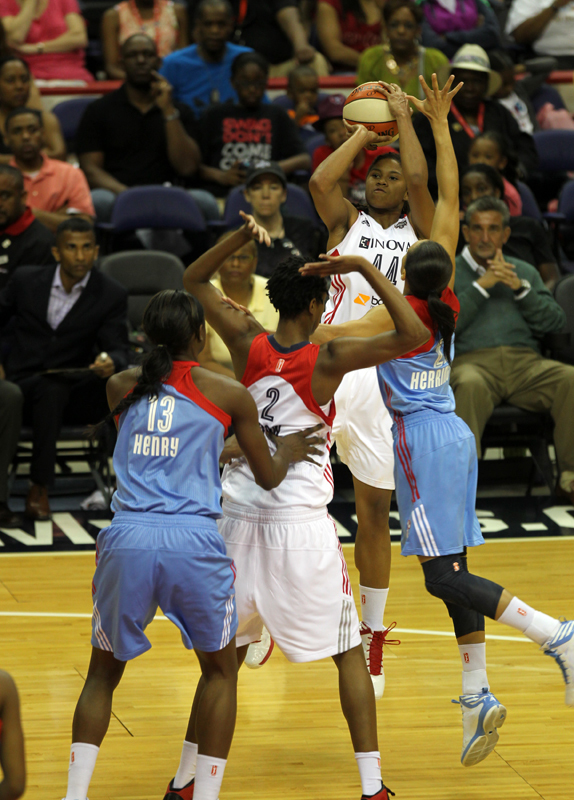 Crystal Langhorne led the Mystics with 15 points and Ivory Latta had 14. Washington committed 21 turnovers, leading to 24 points for Atlanta. “You can’t come out and play like that against a team like Atlanta that lives off of turnovers,” Langhorne said. Atlanta continued to get some veteran leadership from Angel McCoughtry, who as many Dream fans help lead them to the playoffs last season and easily is the leader of this team. McCoughtry’s first basket came on a 3-pointer with 4:16 remaining in the third quarter. She finished 6 of 7 from the free throw line and Atlanta made 16 of 20 attempts. Washington made 9 of 10, but its first free throw did not come until 4:02 remained in the third quarter. Both teams shot 39.1 percent from the field, but the Dream had 20 assists on its 27 baskets. Sancho Lyttle had 12 points and Armintie Herrington 11 for the Dream (3-0), who overcame 20 turnovers for their sixth straight victory over the Mystics (1-1).